A first draft for tomorrow's reflection. 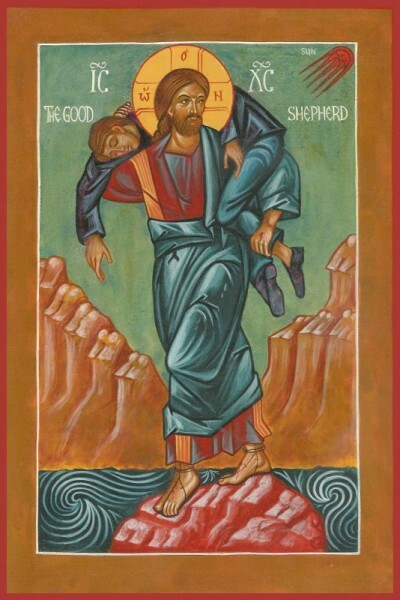 Good Shepherd Sunday has often grated slightly with me but I like the icon I found for it. Last week while driving to Cromwell through the spectacular landscape of Central Otago and the ‘champagne weather’ of a glorious autumn morning, I spotted a fine looking sheep on the middle of the road. He spotted me at the same time and immediately bolted back towards the paddocks and safety; as I sped past I glimpsed him hurling himself vainly at the shut gate through which I guess he might have strayed. I felt a bond between us: in a similar way we too hurl ourselves at the limits of our world; we challenge our finitude; rage at the limits that beset us – of understanding, strength, health, the choices we make, the paths we don’t take or shouldn’t have taken, and so on. Like that sheep we have moments when we struggle with our world and keep battering at our limitations. This Fourth Sunday in Easter is known as ‘Good Shepherd Sunday’ (its gospels are selected from John 10) where Christ is known as the ‘Good Shepherd’ and humankind accordingly as ‘sheep’, whether wayward and foolish, or obedient and safe. The context – the place and the time – for our gospel is the Jerusalem temple in winter on the Feast of the Dedication. The Feast looks back to the Maccabean revolt (164 BCE) when the people resisted Antiochus IV of Syria, regained control of Jerusalem and purified the temple that had been defiled by pagan practices. The Jews gather about Jesus on the anniversary of this event as he strolls about that same temple. But which opens the way into truth – the dedicated temple or Jesus himself? Has the temple become a boundary for faith? It appears that the Jewish leaders cannot see beyond the temple; and certainly that they do not recognise in Jesus the activity and person of God calling them further into him. I keep thinking of that sheep throwing itself at the gate. This past week I had lunch with a scientist who, carrying on from the Easter sermon where I referred to Heisenberg’s Uncertainty Principle, introduced me to some extraordinary concepts in physics. In particular the realisation that if some of the fundamental physical constants in the universe were to vary only very slightly, the universe as we know it would not have happened. · the strength of the force binding nucleons into nuclei is o.oo7; above or below that, life is impossible. · the density parameter: the relative importance of gravity and expansion energy – any variation from what we have and either the universe would have collapsed or no stars would have formed. The universe seems so finely tuned that to attribute existence to mere accident seems almost absurd. (Quoting Fred Hoyle) “the chance of obtaining even a single functioning protein by chance combination of amino acids (is equal to the likelihood of ) a star system full of blind men solving a Rubik’s cube simultaneously”. Of course physicists debate and dispute the implications of this so-called ‘fine-tuning’ but to contemplate it is to be struck with awe at the precariousness of being in this unimaginably vast universe and no theologian can do less. How can we speak of God in this vast context: our anthropomorphic vocabulary, metaphorical though it may be, is inadequate and draws us into banality. Physicist, theologian or poet, our efforts to imaginatively (even dimly) apprehend what is at work here is again to call to mind that sheep battering at the limits of the farm gate. This is the enigma of belief and the mystery of our freedom – we choose to believe; there is no obligation or compulsion. The question is always where do we choose to set our heart? Amidst the great mystery of the universe, in the mystery of ourselves and who we are becoming, where do we set our heart? 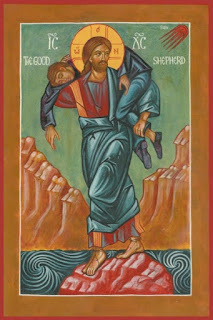 Remembering that sheep flinging itself uselessly against the gate, we need to decide where we set our heart and, notwithstanding all the luggage we carry as our doubts and questions, make the choice to follow Christ, the one who , despite the limitations of the metaphor, we may trust and follow as our ‘Good Shepherd’.